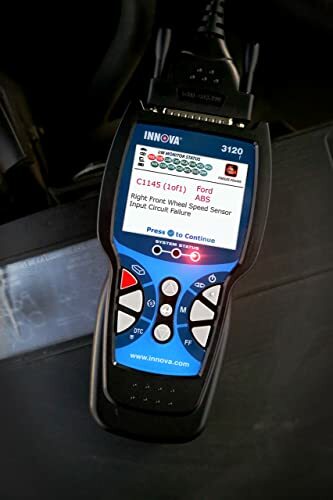 The Innova family of diagnostic tools has plenty of remarkable features which enable you to quickly troubleshoot today’s vehicles. 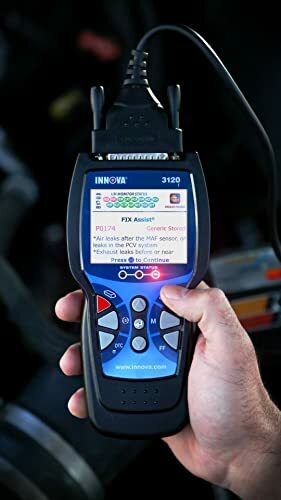 Whether you’re a weekend DIYer or an ASE certified mechanic, the Innova 3120 obd1 & 2 scan tool can easily handle any kind of vehicle computer errors. Worked perfectly the first time I needed it and it wasn’t too hard to figure out the instructions. Just need to sit down and read them. Couldn’t believe how fast it arrived too! 2.1 Who is Innova 3120 Built for? The Innova 3120 obd1 scan tool is compatible with most American, Japanese and European vehicles built since 1996. It also performs OBD I functions on Ford, GM, Chrysler, Toyota, Jeep and Lexus vehicles built from 1981 to 1995. The Innova 3120 can be connected to the car using an OBD I adaptor for OBD I compliant vehicles. The scanner has a 2.8-inch grayscale display, it shows over 20 pieces of information in form of clear and understandable icons, in one view. The tool also has a user-friendly interface that looks appealing to the eye and easy to navigate. The gadget has intelligent software that is designed to retrieve Original Equipment Manufacturer (OEM) codes and generic specific codes. 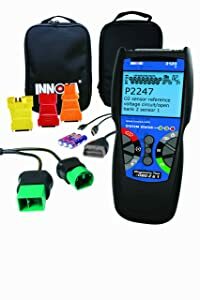 The Innova 3120 obd1 scan tool is capable of diagnosing and re-programming the vehicle’s computer through its OBD I or OBD II full mode functions alongside conducting I/M readiness monitoring. After every 30 seconds, the Innova 3120 obd1 scan tool automatically refreshes data in order to confirm the repairs made. 1. OBD1 and OBD2 Parameters and functions. The gadget provides live data in addition to a standardized series of diagnostic trouble codes (DTCs) which provide for quick identification and rectification of malfunctions within the vehicle. The Innova 3120 obd1 scan tool identifies problematic codes and provides the option to clear them. Some of the error codes are the cause of transmission or emission failures. It can request for and clear emission-related diagnostic trouble codes that may occur during a driving cycle. Other than reading powertrain and vehicle information, this scanner can read and erase current, pending and permanent error codes. The Innova 3120 obd1 scan tool has a battery and oil reset function. You can accurately read the battery’s power and check the oil. When the diagnostic trouble code definition is given, it can be displayed in one of these three languages; English, French, or Spanish. The G and M icons on the screen help indicate whether the code set is either a generic specific code (G) or a manufacturer specific code (M). The car and computer icons show whether the scanner is communicating properly with the car and PC respectively. Numerous emission icons are also situated under an I/M monitor status title. They indicate whether your vehicle’s emission monitors are functioning as required or not. On this tool’s keypad, there is a button labeled FF. When it’s pressed, the tool will display Freeze Frame data. The red button on the left turns off the check engine light (MIL) function. The green button on the right is used to signal the tool to begin communicating with the vehicle. Another unique patented feature of the Innova 3120 is the three color emission status warning lights. These lights indicate how your vehicle will perform in an emission or smog tests. Green means pass, yellow means there could be potential problems and red means you will certainly fail an emission test. the Over 30 states in the US now use an OBD II based system to check for emissions readiness. No live data. Not cover all OBD2 Vehicles, including GM after 2013, Audi 2000 ABS codes. Possible Compatibility Problems. Bottom Line Innova 3120 perfectly suits average car owners, beginners, and DIYers. 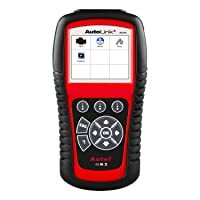 Autel Al619 is a great pick of OBD2 scan tool for average vehicle owners. Autel MD802 is for experienced DIYers and enthusiasts. Who is Innova 3120 Built for? Innova built this device with ease of use in mind. It can, therefore, perfectly suit average car owners, beginners, DIYers, car enthusiasts, and professional mechanics. If you own a repair shop, Innova provides the ideal software solution by giving you a program that allows you to keep track of all repairs you have ever made on the vehicles. You can also print out these reports for your customers. It works perfectly for a wide variety of vehicles. Only one device is needed for the different vehicles. One client mentioned in a review that it works exceptionally well on his two cars plus those of his relatives. The vehicle they had were a 2000 Dakota, 2 Dodge Rams (1995 and 2005), and his step son’s 1998 Durango. Another customer also tried the Innova 3120 obd1 scan tool on a 1995 Ford. When the check engine light turned on, he ran a scan using this tool but it didn’t bring up any fix codes for the check engine light. Instead, a 111 “all systems functioning normally” notification kept popping up. The main reason people go for the Innova is that it’s capable of performing both OBD I and OBD II functions. It is worth noting that OBD I compliant vehicles have fewer diagnostic trouble codes available than OBD II equipped vehicles. 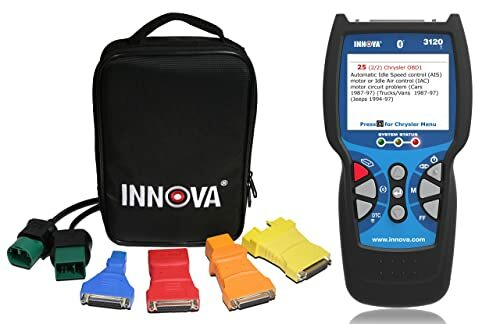 The Innova 3120 obd1&2 scan tool comes with all the features and functions you’ll find in the industry’s best selling hand-held diagnostic tools. This here is a truly scientific scan tool. A lot of extra effort has been put by Innova to ensure that the 3120 gives precise diagnostics and quality solutions. You’ll certainly get much more than your money’s worth. There are a plethora of OBD2 scanners on the market but we suggest you opt for a good VEEPEAK OBD2 Scanner as they are quite reliable. You are going to buy either OBDLink LX or OBDLink MX and want to see the match OBDLINK MX vs LX? Well, this detailed review will make up your mind. 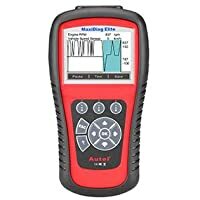 I would recommend the Autel Autolink AL319 OBD2 & CAN scan tool because it does what it is supposed to do, have live features, and is very affordable. TPMS Light Is On: What Does It Mean? What To Do? Under-inflation and over-inflation are the main triggers of the TPMS light, it can come on for other reasons. But what are they? What can I do when TPMS Light is on? Actron CP9695 ABS Code Reader Review. Actron CP9695 ABS Code Reader is built for average car owners with minimal knowledge of car repair, no professional mechanical skills needed.